There’s so much to see and experience in San Diego that a family needs to be ruthlessly strategic to maximize scenery-absorbing, relaxation-enjoying, and relationship-fortifying moments together. Here are some tips to help the captain of your vacation avoid the temptation to do it all. San Diego is known for its amazing beaches, scenery, and weather. You can wade, swim or surf while being watched by some of the world’s finest lifeguards. If Fido is tagging along on your trip, note that North Beach (Coronado) and Dog Beach (Ocean Beach) are pet-friendly; dogs are generally not allowed on most public beaches. North Pacific Beach (aka North PB) is a family-friendly beach with minimal boardwalk and businesses. This mile of sand covers the shoreline south of Tourmaline and north of Garnet. With free parking, spots are scarce at peak hours. KidTripster Tip: Review with your adventurous tweens and teens how to react if caught in a rip current. Click here for more. Constant supervision of inexperienced waders is warranted. Ideal for sand castles, surf lessons, and kayaking, La Jolla Shores is located a short ride from numerous upscale restaurants and shops. Adjacent parking available. KidTripster Tip: Summertime is ray season (and I don’t mean from the sunshine kind). Remind your kids to shuffle their feet entering and exiting the surf, so as not to step on sting rays. Featuring concessions, a fishing pier, and a playground, Imperial Beach (aka IB) has a completely different vibe than points north. This shoreline supplies the classic So-Cal experience. Plus, it features a colorful, sculptural sign for family photo ops. KidTripster Tip: IB has sand-friendly wheelchairs to make the beach more accessible for those with limited mobility. 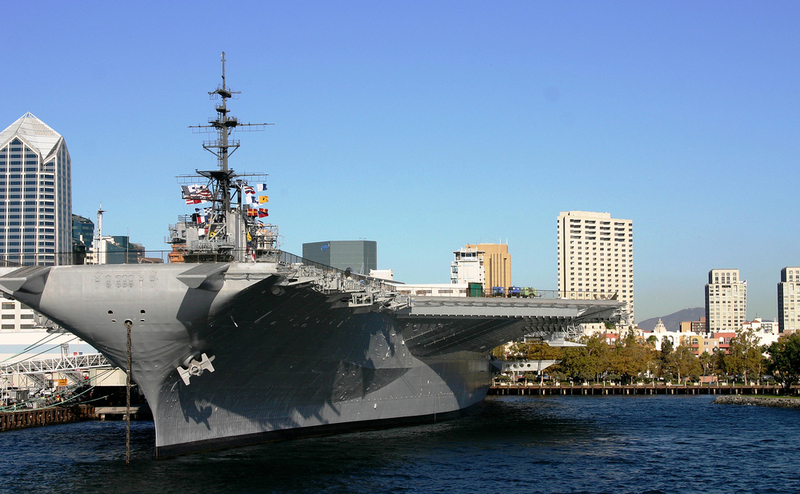 With a professional sailor in our family (aka Dad), my kids can readily tour an active warship; yet this decommissioned aircraft carrier remains one of their favorite destinations. The flight deck at the U.S.S. Midway Museum has more than a dozen aircraft, some of which have interior accessibility. There are free audio tours (giving tweens and teens an excuse to wander around with authorized headphones) as well as flight simulator experiences (extra fee) in the hangar bay. God bless America and all the ships at sea! Cost: Youth $10; Adults $20. KidTripster Tip: You’ll want a sling or back carrier for wee visitors as the interior exhibits are not welcoming to strollers; but beware, climbing up and down the equivalent of a multi-story building will give your legs and back a workout. Everyone should wear closed-toed, non-heeled shoes. I’d recommend SeaWorld San Diego for families with young children. Even though the park has a handful of thrill rides like Electric Eel and Journey to Atlantis (plan to get soaking wet! ), the park on the whole isn’t stimulating enough for the average tween or teen. Plan to spend quality time feeding the dolphins, riding through/under the Shark Encounter, catching a show, and petting rays with your little ones. Save the indoor aquariums for refuge in the heat of the day. Online weekend cost: Youth (under 3) Free; Other $70; discounts available for weekday visits and 3-for-1 tickets that includes SeaWorld, San Diego Zoo and San Diego Zoo Safari Park. SeaWorld also operates Aquatica Water Park, but it’s about an hour’s drive southeast of the main park. Cost: Youth (under 3) Free; Other $40; look for special offers like a free child ticket (ages 3-9) with full-price adult admission. If a less expensive dip into marine biology is desired, then substitute Birch Aquarium (2300 Expedition Way, La Jolla) with plenty of educational value and a fraction of the acreage to cover. The highlight: a trio of touchable tide pools on the rear terrace. Cost: Youth $14; Adult $17. The San Diego Zoo is a world-famous destination, but be strategic. Arrive when the zoo opens and immediately proceed to the panda viewing area before the line stretches beyond an hour’s wait. After that, visit the mesa to see the elephants and giraffes. My kids’ hit parade also includes the polar bears, the shaded aviary, the meerkats, the primates, and the see-through, above-your-head big cat walkways. We hit the reptile house last for some afternoon shade and its near-the-exit location. Skip the shows, unless you need a snack, nursing break or really relish sitting in amphitheaters. Cost: Youth $40; Adult $50. KidTripster Tip: Bus lines grow throughout the day. You can view roughly three-quarters of the exhibits from the bus, so ride early and then double back to see the animals that most excite your entourage. 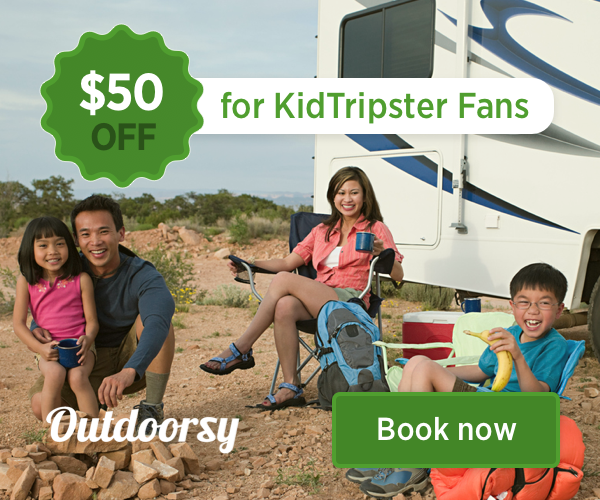 KidTripster Tip: Scope out possible discounts online in advance. Unlike many large zoos, this one does not embrace reciprocity agreements. Buy your tickets in advance to avoid starting your visit in line. Although operated by the same entity, Safari Park (15500 San Pasqual Valley Road, Escondido) is located 45 minutes away from the zoo and requires separate admission. Pack as much as you can into your day here. Highlights for our brood include the Africa Tram, Lorikeet Landing (extra fee), the Feathered Flyers Bird Show, and Cheetah Run. Cost: Youth $40; Adult $50. KidTripster Tip: If you have one day, pick one park. If you have more than two days in town, do both. A two-day park-hopper ticket is available, saving a few dollars. Much of Balboa Park can be enjoyed with no admission or parking fees (so long as you don’t visit during December Nights). Below find a partial list of our family’s favorite spots among these 1200 acres. KidTripster Tip: There’s a festival, race or special exhibit almost every weekend. Unless the weekend’s schedule is of interest, visit during the week to enjoy a more relaxed atmosphere. You may happen upon a rehearsal or performance at Spreckels Organ Pavilion; if not, feel free to let your child “perform” while you enjoy the architecture and bench seating. Along Plaza de Panama, enjoy the Museum of Art’s exhibition, entitled Art of the Open Air or stroll into the adjacent May S. Marcy Sculpture Court and Garden. What a charming and low-pressure way to introduce tikes to art. Nearby, just outside of the Mingei International Museum, is the outdoor play sculpture, Nikigator. The gator is on a playground-style surface on purpose. Take the kids out of the stroller and let them touch the mosaic! Take a gorgeous stroll through the Japanese Friendship Garden (2215 Pan American Rd. E.). It’s best viewed with sleeping babies or children old enough to honor the serenity of the gardens. It’s particularly spectacular around the Spring Cherry Blossom Festival. Cost: Youth $7; Adult $8. Watch the koi, marvel at lotus flowers, and listen to the music of omnipresent street performers at the free Botanical Building with the Lily Pond and Lagoon (1549 El Prado.) Head inside to see the always-popular carnivorous plants. Closed on Thursdays. My family’s favorite playground remains Pepper Grove Park with a Seussical take on standard playground equipment. Picnic tables in the shade abound. It’s located south of the Reuben H. Fleet Science Center along Park Boulevard. 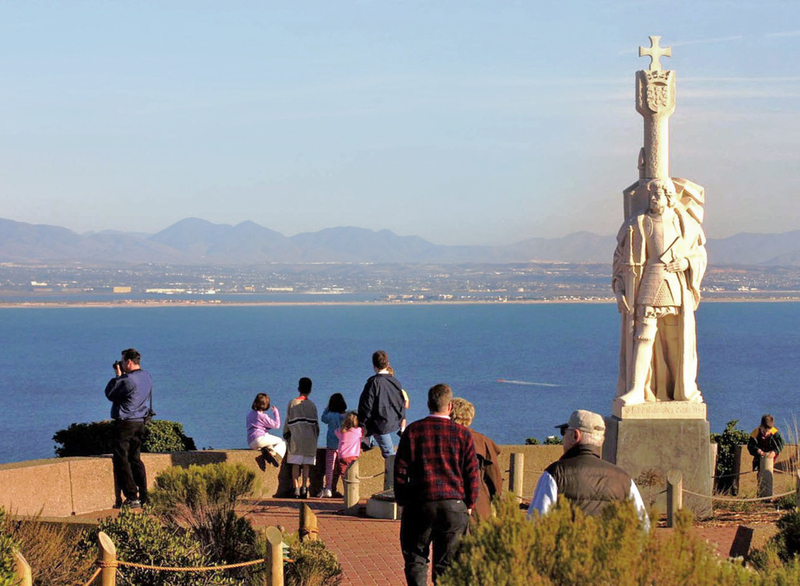 Boasting a lighthouse on high and tide pools below, count on phenomenal ocean views at Cabrillo National Monument, as well as more than you may want to know about San Diego history. Maybe your family will spy a migrating whale or a Navy ship on the horizon. Afterward get a quick bite at Point Loma Seafoods and enjoy the afternoon on the beach. Cost: Car $10; free admission with National Parks and Federal Recreational Lands Annual Pass. KidTripster Tip: Don’t miss the tide pools. They’re a short drive and hike from the monument. Best to visit one hour before low tide or one hour after low tide. Bring a change of clothes; the kids will likely get wet. 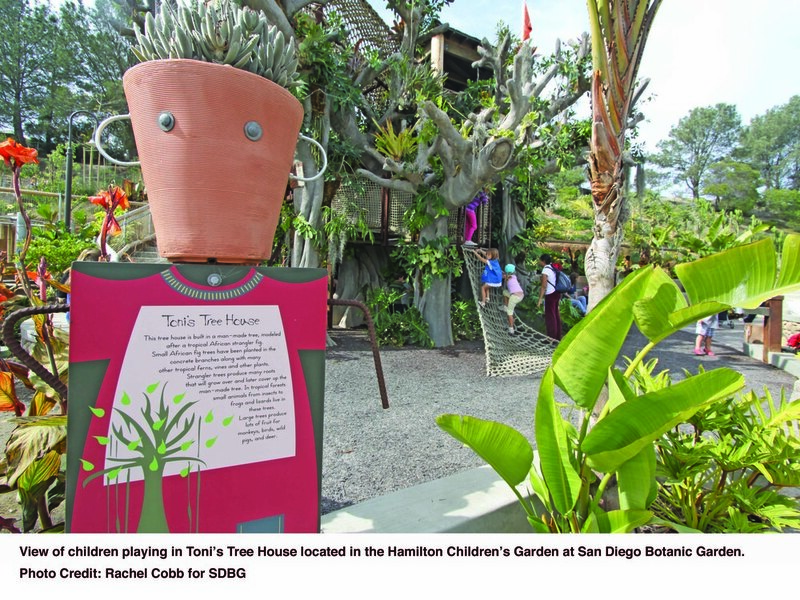 With only a small gift shop, plant store, and minimal refreshments available for purchase, the focus at the San Diego Botanic Garden is actually on (gasp) nature. The Hamilton Children’s Garden is a delight for young kids with hands-on opportunities for sensory exploration. Try to arrive when the park opens for wide open frollicking and depart by lunchtime. My family thinks this spot is a great place to recover, recalibrate and, just maybe, relax. Cost: Youth $8, Adults $14. A permanent amusement park with million-dollar views and only a stroll from Mission Beach, Belmont Park is great fun for tweens and teens. The wooden Big Dipper roller coaster supplies history and wave machines lend a modern twist. Rock climbing, laser tag, mini golf, and zip lining combine for high-energy entertainment. Cost: Youth $38; Adult $49; Costco members can obtain highly-discounted passes online with e-mail delivery. Who doesn’t love LEGOS?! Located 45-minutes north of San Diego, LEGOLAND California Resort is a great family destination. In addition to the amusement park, there’s the LEGOLAND Hotel, LEGOLAND Water Park, and SEA LIFE Aquarium (my advice, skip the aquarium). While you’ll see teenagers at the amusement park, I think that it really tops out at about age 10. For a full review of the parks and hotel, click here. Cost: Youth: $87; Adults (13+) $93; multi-park and multi-day discounts available. Again, choices abound at Balboa Park; this time, we focus indoors. Free parking; admission fees vary; consider a Balboa Park Explorer One-Day or Multi-Day Pass for savings. KidTripster Tip: Some museums are closed on Mondays and Thursdays. There’s a rotating list of museums that are free to locals on Tuesdays, meaning it’s crowded. Your best bet? Go Wednesday or Friday, or check online to make sure your preferred museum is actually open. Military, aviation, and space history is on display at San Diego Air & Space Museum (2001 Pan American Plaza). My kids especially like the inner helicopter courtyard. Cost: Youth $10.50; Adult $19.50. Take a peek in the no-admission Timken Museum (1500 El Prado). Displaying world-class artworks, parents can briefly breathe in culture (and air-conditioning, sweet air-conditioning) before continuing on to more child-centric destinations. If you have a locomotive lover in your midst, then visit San Diego Model Railroad Museum (1649 El Prado), the largest of its kind in the world. Closed on Mondays. Cost: Youth $4; Adult $10.75. Far and away the most eclectic of Balboa Park’s museum offerings, the Mingei International Museum (1439 El Prado) is intimate, colorful, and constantly-changing. One season, we saw a Surfboard exhibit; another time is was an ironworks exhibit; another time - chairs. Closed on Mondays. Cost: Youth $7; Adult $10. A rite of passage for San Diego’s native preschool population, puppet shows are offered at Marie Hitchcock Puppet Theatre (2130 Pan American Plaza) at least twice daily Wednesday through Sunday. Cost: Youth $5; Adult $5. • Future paleontologist? Go to the Natural History Museum. • Future archaeologist? Go to Museum of Man. • Car buff? Go to the Automotive Museum. • Sports fan? Go to the Hall of Champions. • Science lover? Go to the Reuben H. Fleet Science Center. • Art lover? Go to Museum of Art. For Top 10 Stays in San Diego, click here. For Top 10 Eats in San Diego, click here. Moira Allbritton was voted “Least Likely to Live in So-Cal” out of 496 students in her corn belt-located high school graduating class. Despite this inauspicious designation and her general loathing of sand on the floor, she has called San Diego home for more than two decades as a Navy wife and mom to five boisterous, quirky characters.